Click here to see how by the Hebrew & Greek Gematria method his Name calculates to exactly 666 not only in Hebrew but also in English. Just remember that Osama Bin Ladin is really Osama Bin London. He is the paymaster for the terrorists working for MI-6 and the CIA, in the Mid East, West Asia, and Africa, nothing more. The parallels are amazing with all the instant replays that no one remembers. Like how Russia was Hitler's ally at the start of WWII. Just like now Russia is Bush's ally at the start of WWIII. Hitler's Thule satanist society of Germany is the same as Bush's Skull & Bones satanists society of America. How much General Patton hated having to have to wait for the Russians to get the glory of taking Berlin. How the Russians beat the Americans to Kosovo airport. And how the Russians whisked away and moved out Sadam in advance of the US forces. It is helpful to view from the top of this Satanic Antichrist pyramid structure. This gives a better overall view that explains many mysteries of iniquity from the top perspective. When you go to the top of the Antichrist structure and scheme of things, you have to look at the prince himself. Otherwise you always have major pieces of the puzzle missing. Knowing the identity of the antichrist causes many mysteries to be clarified. "And the dragon gave him his power and his seat and great authority." The dragon is "symbolic" to others, but not to Prince Charles. He has a red dragon on his coat of arms. 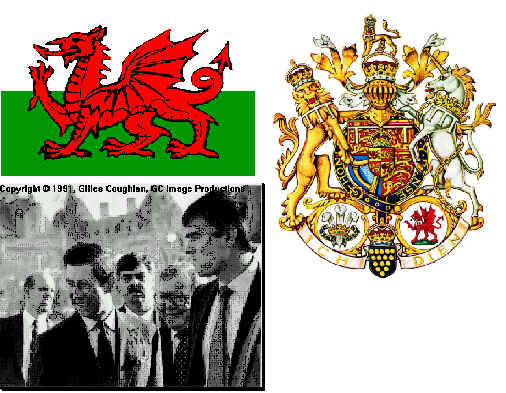 It comes from the flag of Wales, and it is in this title, Prince of Wales, that Charles is heir-apparent to the throne of Great Britain. At his coronation (investiture as Prince of Wales) in 1969, he sat on a chair with a large red dragon emblazoned on it. During the ceremony, his mother Queen Elizabeth II said, "This dragon gives you your power, your throne, and your own authority." His response to her was, "I am now your Liege-man, and worthy of your earthly worship." Liege is an old English word meaning "Lord". "I am now your Lord-man, and worthy of your earthly worship." Another reference to the red dragon is in Revelations 12:3 And there appeared another wonder in heaven; and behold a great red dragon, having seven heads and ten horns, and seven crowns upon his heads. Prince Charles is the ONLY person in the world to whom "And the dragon gave him his power and his seat and great authority" can literally be applied to! Take a close look at that Coat of Arms. Can you find those 10 lions and 7 CROWNS? The chain on the unicorn is loose, all previous coats of arms show it attached. 2 Th 2:6 And now ye know what withholdeth that he might be revealed in his time. Psa 2:2-3 The kings of the earth set themselves, and the rulers take counsel together, against the LORD, and against his anointed, saying, Let us break their bands asunder, and cast away their cords from us. Inner motto reads "Evil on him who thinks evil". Lower motto reads "I serve", "Service is something that you give to people, particularly if they want you to - but sometimes if they don't"
Another symbol on Prince Charles' Coat of Arms is that of The Order of the Garter. The Order of the Garter is the parent organization over Free Masonry, worldwide. When a man becomes a 33rd Degree Mason, he swears allegiance to that organization, and thereby to Prince Charles. According to "The 'Morals and Dogma' of the Ancient and Accepted Rite of Freemasonry" written by Albert Pike (Grand Commander, Sovereign Pontiff of Universal Freemasonry, July 14, 1889) Lucifer is the GOD of Freemasonry (see page 321 of the 1942 edition). On page 819 you will find just one example of why there are many people in Freemasonry who believe that it is natural to be a Christian and a Mason. Masonry intentionally misleads the low degree initiates and hides the truth that the god of Freemasonry is Lucifer, except to those in the 30th and higher degrees. "The Blue Degrees are but the outer court or portico of the Temple. Part of the symbols are on display there to the Initiate, but he is intentionally misled by false interpretations. It is not intended that he shall understand them; but it is intended that he shall imagine he understands them." Further proof of Lucifer worshipping amongst Freemason can be seen in how they measure the year. For instance the year 1998 (up until September) is according to freemasonry the year 5997 AL (that is 5997 anno Lucifer). On March 6th, 1996 on CNN, Prince Charles showed the world that he and his two sons William and Harry, had been the first people to be voluntarily implanted with a microchip (traceable 666 biochip) in their right hands, allegedly for security purposes. On June 26th 1994, Charles announced that when he becomes king he will relinquish the monarch's role as head of the Church of England. He said he would rather be seen as "defender of faith", or "defender of the faiths," rather than "defender of THE faith." This subtle difference that results from removing the THE from his title escapes most people. His new title without the THE means that he will protect all other faiths from THE Faith. The prince went on to say. "I happen to believe that the Catholic subjects of the sovereign are as important [as the Protestants], not to mention the Islamic, Hindu and Zoroastrian," he told the independent Television network. There are currently at least two biographies available on Charles that describe his desire to unite all the world's religions 'in order for peace' (see Daniel 11:37). Various reports have appeared in London and Arab newspapers over the last few years, claiming that Charles has converted to Islam. This supposedly took place when he met with the mufti of Cyprus Shaykh Nazim Adil (in 1993). Now while there's no actual evidence to prove that he has converted to Islam, there is no evidence to prove that he hasn't. In fact his lecture delivered in February 1994 at Oxford extolling the virtues of Islam, his frequent visits to Islamic holy places, his dedication of a South London mosque, outfitted in traditional Sunnah attire; and his 1993 trip to see the Quran of Sayiddina `Uthman (in Tashkent, Uzbekistan) with Shaykh Hisham Kabbani, only lend credence to the claim. Of course, this is just the sort of tactic to expect from the antichrist. That is to say, if he were to openly come out and say that he had converted to Islam, this would make many Jews wary of him. Whereas, if he were to spread rumors that he was a Muslim and not publicly deny them, then he could get Muslims on side whilst not alienating Jews. On June 2nd 1953, with the knights of the garter carrying and holding the canopy over her head, Elizabeth II was anointed and crowned as "Queen of thy people Israel". Both Prince Charles and his mother believe that the throne upon which the queen was crowned, the famous coronation chair at Westminster Abbey in London, is the rightful throne of King David. One of the reasons for this is because up until recently it contained a 336 pound stone known as Jacob's Pillar (also referred to as Jacob's head-rest, the stone of Scone, or the stone of destiny). For more information on the significance of this stone see Genesis 28:18. In 1296, Edward I stole the stone and took it to England, where it was placed in Westminster Abbey, and used since 1308 for English coronations. On St Andrews Day, 30th November 1996, on Queen Elizabeth's orders, the stone was taken back to Scotland and installed in Edinburgh Castle. Many people believe that this stone will be used to crown the antichrist (posing as the messiah). (See also Ezekiel 21:27, Genesis 49:10, Daniel 9:24, and Ezekiel 37:22). Many blasphemous European royalty including Prince Charles and Queen Elizabeth II claim to be of the Blood line of Jesus Christ and Mary Magdalene. According to the lie, Jesus didn't die on the cross and rise from the dead. Instead they claim he married Mary Magdalene and fathered a number of children. This bloodline is referred to as the "Holy Grail", with those possessing it believing themselves the rightful heirs to the throne of Jerusalem. They believe that a new king of "the holy seed of David" will preside over the "Masonic kingdom" of Israel and the world. Prince Charles' link to the non-existent bloodline of Christ is through the Merovingian Kings of France. He is allegedly descended from the Merovingian Hildegarde. Princess Diana's Bloodline can also be traced back to the Merovingians. This is why Prince Philip selected her. His World Business Forum comprises 200 of the world's top corporate leaders and consolidates 26% of the world's wealth. Charles is literally able to steer the environmental ethics & business agendas of the world's most powerful multinational companies. The holdings of the House of Windsor constitute enormous wealth including the Archer-Daniel's-Midland company (they are stockholders with controlling interest) which controls 75% of the world's grain. In times of famine, the royal family will literally be able to control who eats and who starves. Prince Charles considers himself to be psychic and believes in guidance from the spirit realm. The Queen (also involved in spiritism) and Prince Philip both believe that Charles, "is the Chosen One - placed in line for the throne through a divine, preordained plan." In the early 1990's representatives of Israel and the Palestinians were invited to a secret meeting in London, during which it was decided to try secret negotiations in Oslo, Norway. The Israelis were represented by Yitzchak Rabin, and the Palestinians were represented by King Hussein of Jordan (both 33rd degree masons). The third party at that meeting was Lord Victor Mischcon (also a 33rd degree mason), and personal attorney for Prince Charles. Prince Charles attended the funeral of Yitzchak Rabin. Within two hours after the funeral, according to the Jerusalem Post, Prince Charles was in Prime Minister Shimon Peres' office "insisting" that he attend a meeting at the Orient House, (in the Palestinian sector of Jerusalem), to begin negotiations to give back the Golan Heights to Syria. To truly understand Charles, it is important to understand his father, Prince Philip. Philip is a eugenicist who wants reduce the population of this planet from a current level of about 6 billions persons, to much less than 1 billion within the next two generations. To quote Prince Philip "In the event that I am reincarnated, I would like to return as a deadly virus, in order to contribute something to solve overpopulation." Prince Charles may seem like a wimp, however he is quite athletic, an expert horseman, a qualified jet fighter pilot in the Royal Air Force, a qualified helicopter pilot in the Royal Navy, and a senior military officer in all three branches of armed services. No one else on Earth has the religious, political, financial, historic, and other ties that Charles has! Prince Charles media exposure has exceeded that of any other man in history. Still not convinced, then read 2Thessalonians 2:9-12 Even him, whose coming is after the working of Satan with all power and signs and lying wonders, And with all deceivableness of unrighteousness in them that perish; because they received not the love of the truth, that they might be saved. And for this cause God shall send them strong delusion, that they should believe a lie: That they all might be damned who believed not the truth, but had pleasure in unrighteousness. Born Charles Philip Arthur George Mountbatten-Windsor in 1948, crowned Prince of Wales in 1969, the future King George VII, as he will be known, has an abundance of titles reflecting his wealth and power. He is related to all of the royal houses of Europe and his lineage goes back to Charlemagne, the titular kings of Jerusalem and the ancient kingdoms of Persia and Babylon. Though the media has continued to paint Britain's Prince Charles as a polo-playing two-timer, his long list of accomplishments include musician, recognized painter, horseman, man of war and businessman. He holds the rank of major general in the British Army, rear admiral in the Royal Navy and air vice marshal in the Royal Air Force. Furthermore, he flies a variety of jet fighter planes including the Chipmunk, Spitfire, Nimrod, Phantom, Jet Provost and Harrier T4. As king, he will hold three important offices: king of a 1,200-year-old monarchy, head of the Anglican church and true head of state since the army and navy report directly to the sovereign and not to the prime minister. When not in uniform, Prince Charles wears a business suit, using his clout as a major force behind the scenes, affecting the whole agenda of the United Nations. In 1991, he brought together major world leaders and multinational corporations to discuss how to obtain consensus on "Agenda 21," a pagan-centered environmental philosophy. The outcome of the United Nations Conference on the Environment and Development in Rio de Janeiro in 1992 brought us sustainable development and the Biological Diversity Treaty. Currently 37 states have adopted "Smart Growth" policies which stem from the Biological Diversity Treaty. In 1990, he formed The Prince of Wales International Business Leaders Forum in Charleston, S.C. Over 100 CEOs in the United States met to discuss their role in a changing world. They concluded that chief executive officers have a critical role to play in (1) setting company values and listening to concerns of community leaders, (2) ensuring that corporations adopt sustainable development practices, and (3) assisting community leaders in inner cities and in rural areas to regenerate neighborhoods. Up until the recent World Economic Forum meeting in New York, this organization has had no exposure on the local level. On the global level, the Prince of Wales International Business Leaders Forum has become the key originator and broker of new innovative corporate policies and practices, supporting the structural change in government to partnerships with business. Many popular corporations are a part of this including 3M, Cable and Wireless, TRW, Coca-Cola, BMW, Volkswagen, CIGNA, DHL Worldwide Express, Levi Strauss and the Ford Foundation. As a result of public-private partnerships, the growing role of corporations is expanding. The balance sheet of many multinational corporations is fatter and healthier than most Third World countries. Corporations have the ability to produce wealth and increase the power of any impoverished nation to lift its citizens out of the gutter. For all of these reasons, the CEO is now moving into the visible position of statesman. To highlight the importance of this shift, the World Economic Forum and the Prince of Wales International Business Leaders Forum announced a "Framework for Action" that chief executives, chairmen, board directors and executive management teams can use to develop a strategy for managing their company's impact on society and their relationship with employees, customers, suppliers and members of the community. The Framework has three commitments. First, to commit to being "global corporation citizens" in the way businesses are run. Two, "to identify and work with key stakeholders in our main spheres of influence." Third, "ultimate leadership for corporate citizenship rests with us as chief executives, chairmen and board directors." The 36 corporations include business leaders from different countries and industry sectors. Some of those signing on from America are: Arthur D. Little, Inc., Coca-Cola, Fleetboston Global Bank, ING Group, McDonald's Corporation, Phillips-Van Heusen and S. C. Johnson Wax. Adrian Hodges, director of the Miami office of the Prince of Wales International Business Leaders Forum, informed me that they have had a "tremendous amount of interest and willingness from U.S. corporations on how to integrate corporate citizenship in their business." Additionally they are working with both the U.S. Chamber of Commerce and the Latin American Chamber of Commerce. In explaining their role, he said, "We are a wholesaler rather than a retailer of ideas to the corporate sector, so we work through organizations so they can reach the masses of corporate America." If you lost your greatest possession to a group of terrorists, wouldn't you look for a different way to bring them back? The developed world does not use guns and bullets to effect change â they use ideas, thoughts, concepts and understanding. The British lost the War of 1812 to a bunch of illiterate sharpshooters from the mountains of Kentucky and Tennessee. It appears they have changed their tactics. America be on guard. THE BRITISH ARE COMING!! !